The Competitive mode which delivers a much richer experience exploring the backstory of simulation theory and the lore of the Megacorp Universe. The competitive mode uses the same components as the casual mode of the game, just with a few small tweaks. Four additional zero value challenge cards will be added to the components. Competitive mode requires a 5 x 5 main board instead of the standard 5 x 4. Add the 4 special zero challenges to the challenge deck for each reality. Remove the "Exit" Treasure card from each reality. Put the boss of challenge card from the starting Reality in the center of the board (located at the coordinate 3x3) face up. Shuffle the rest of the starting reality challenge cards and then deal them face up from the top left of the grid, until you have filled in all 5 x 5 spaces. When the game begins, select a reality. Instead of random assignment of characters, each player may select a character of their choice of that reality. IF two players select the same character, they can roll dice to determine who gets that character (highest roll wins) and the player with the lower roll will have to select another. This means any challenge card that has a card above it, to its left, to its right and below it may not be selected. Invalid selections will be treated as a miss. If no cards may be selected due to this by any player, the nearest cards to the edge may be selected instead. Effectively, players would have to start selecting cards around the edges of the 5x5 grid when they first play competitive mode and work their way inwards to the boss card. 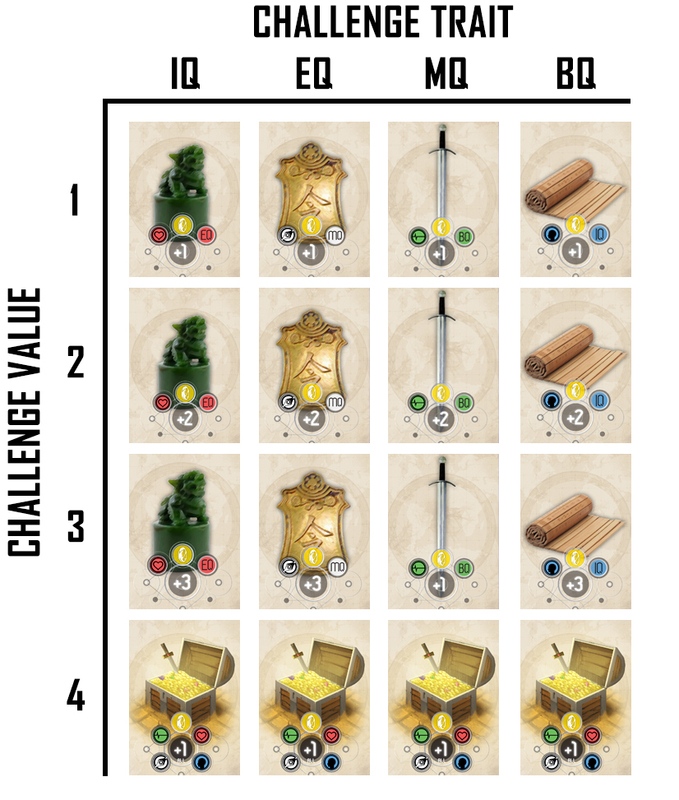 Treasure is handled differently in competitive mode: an IQ challenge yields a EQ treasure, a EQ challenge yields a MQ treasure, a MQ challenge yields a BQ treasure and finally a BQ challenge yields an IQ treasure. Basically each type of challenge when defeated, gives the player a treasure of the type of the trait to the RIGHT of it in the order on the character board. The value of the treasure corresponds to the value of the challenge from 1 to 3. That means a 1 EQ challenge yields +1 MQ treasure, a 2 EQ challenge yields a +2 MQ treasure, a 3 BQ challenges yields a +3 IQ treasure and so on. All 4 point challenges grant a + 1 ALL treasure. In Competitive mode, the only way to ascend is to defeat the Boss Challenge, located at the centre of the board. When a player defeats the Boss, they do not place it in their score pile as usual, but instead must return it to the board at the end of the turn. The player may return the Boss card to any empty space on the board except the centre. The first player to ascend each Reality takes the Gold ascension token, and places the Boss of the next Reality in the (empty) centre space - subsequent players take a Silver ascension token. Players that ascend skip their next turn and choose a new Character from the next Reality. After skipping the turn, fill all empty spaces with Challenge cards from the new Reality, and turned them face up. If an ascended player challenges the Boss from a lower Reality, this triggers another refill of the board: the player replaces the defeated boss in an empty space, then fills all other empty spaces with random, face up Challenges from their current Reality. If a player from the Reality as the Boss also Challenges it on the same turn, instead of losing in PvP, they ascend. In Competitive mode, a player is Force Ascended only if they are unable to defeat any remaining challenges on the board, except for any bosses (assuming they equip their strongest Treasures) AND defeating any boss will not cause ascension or a board refill - this can be either because the board is already full of undefeatable and higher Reality Challenges or if there are no Challenges remaining to refill onto the board. Death works the same way as Classic mode except players that die do not change their character. The final steps in Competitive mode are the same a Classic mode: after a player ascends from the final Reality, there is one additional turn and then all players tally their Victory Points from Challenges in their score piles plus ascension tokens to determine the winner.